Brand new for 2018, OASE Germany, the market-leading brand in pond technology, have developed the cutting-edge Lunaqua Power LED XL spotlights for more demanding underwater lighting applications in ponds, lakes and larger water feature installations. Based on the outer housing of the previous model Lunaqua 10 LED spotlights, the Power LED XL lamps generate a considerably higher lumen output using next generation LED technology. 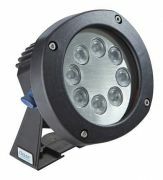 The Power LED XL lamps can be mounted underwater or above ground and are available in cold white (4000 Kelvin) or warm white (3000 Kelvin) guises to suit contemporary or more traditional illumination. Each colour range has four different options with regards to beam angle, ranging from 10 degrees (narrow beam) through to a wide flood beam of 44 degrees. The beam angle options allow the user to select the most suitable spotlight for the particular subject to be illuminated, such as treelines, border planting, up-lighting of buildings or pond and fountain illumination. For longer range lighting applications, the Narrow Beam Power LED XL can illuminate up to 22 metres distance. Due to OASE’s continuous investment in product development, the Power LED XL spotlights can produce a considerable 1350 Lumen output in the cold white or 1250 Lumen output in the warm white version, yet consume only 15 watts per spotlight. As a rough comparison, the Power LED XL spot lights provide a similar lighting output to a 100 watt traditional Halogen lamp. As far less heat is generated by the new generation A+ Rated energy efficient LED clusters, the light housing does not require water cooling so can be used in a wide range of outdoor, garden, commercial or underwater applications. The Power LED XL driver/transformer is designed to be fully submersible down to 4 metres water depth and features robust cable terminals to secure and seal the spotlight connections. Each transformer can support up to 30 watts so two lights of any beam angle or colour range can be connected. Each spotlight is supplied with a 5 metre cable length but this can be extended if required using one of the optional 10m Extension Cables which are fitted with the same robust submersible cable terminals. 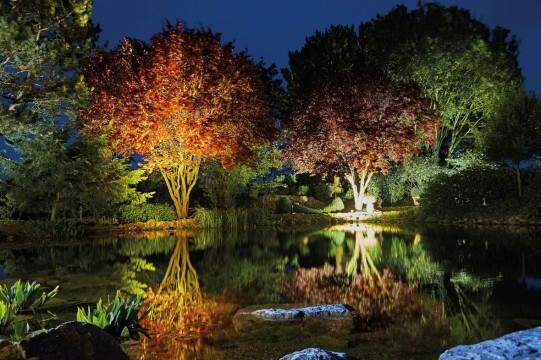 If you have a garden or pond lighting project and would like more information with regards to which lights are most suitable, call our team of experts on Portsmouth 02392 373735 or Contact Water Garden Ltd with your project requirements.